Noble's has been a trusted source for over 40 years. 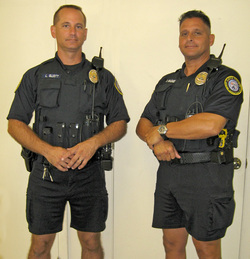 Supplying local Police, Fire Departments as well as any local business work apparel. We specialize in logo design and embroidery. We can also provide complete Uniforms. Some of our clients include Davie, Seminole, North Miami Beach, Aventura, Broward College, Nova University and many others. We carry many different brands of apparel such as 5.11 Tactical, Tact Squad and Tru-spec. Please call us if you want your company to stand out from all the rest! With over 6,000 square feet of factory space, there is no job too big yet we will do quantities as small as one piece. We strive to maintain a custom feel with a walk in store where we can consult with customers one on one. We have seamstresses on staff for any alterations needed. We also have on staff artists to help with custom design challenges. Take a look at some of our samples! Above an example of a custom embroidery made from a photograph.